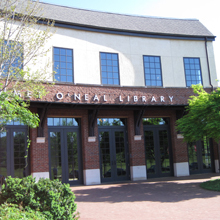 The Emmet O'Neal Library in Mountain Brook, Alabama, serves a population of approximately 21,000. In addition to traditional services, Emmet O'Neal Library offers movies, music, programs, special events, e-books, e-readers and more for all ages. Approximately three years ago, the leaders at Emmet O'Neal Library began exploring a digital alternative to print magazines and periodicals and quickly settled on Flipster, EBSCO’s easy-to-use digital magazine newsstand. Since then, digital magazine usage has increased each year and the library is very pleased with the platform. Emmet O'Neal Library began subscribing to Flipster in June of 2014. Although Flipster was a new product at the time and many libraries were using Zinio, the library staff felt peace of mind implementing a product from a company they trusted. According to Adult Services Librarian Katie Moellering, the convenient Flipster app, the wide selection of magazines as well as the EBSCO connection to their hometown made the choice a simple one. In addition to the hometown connection and the easy-to-use format, Moellering also appreciated Flipster’s straightforward pricing structure and hassle-free setup. To access Flipster, a patron needs only a library card and an Internet connection. It’s also easy to download the Flipster app for Apple and Android phones and tablets and Kindle Fire tablets and browse magazines directly from the app. Once the switch to Flipster was complete, Emmet O'Neal Library posted an announcement on its website and sent a newsletter to library patrons letting them know that a new digital magazine service was available. The library also hung posters, applied stickers to print replicas and handed out bookmarks. The new service was also promoted through a partnership with the local Community Center. The library currently subscribes to 48 titles including must-have magazines such as TIME and Us Weekly and popular special interest magazines such as Runner’s World and Yoga Journal. To meet the needs of vocational students and educators, the library subscribes to titles such as Car & Driver and Popular Science. Currently, patrons of Emmet O'Neal Library can download their favorite magazines to their electronic devices for anytime reading. This enables the library to offer services outside of regular operating hours. Patrons of Emmet O'Neal Library are pleased with the selection of Flipster magazines. When Moellering and her staff receive magazine suggestions, they can quickly add new titles and make them available to the public immediately.